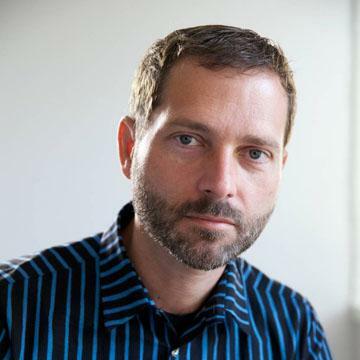 The Pipeline #52: Horace Dediu – 5by5. Apple’s revenue for the first quarter was $24.7 billion, which at 83% was the largest quarterly revenue growth they ever experienced. Operating margin was an all-time high of almost $7.9 billion, representing 31.9% of revenue and yielding 95% EPS growth. After earnings were announced the share price reached $350.7. This includes $70 in cash. Trailing twelve months’ earnings were $20.97. That makes the Price/Earnings ratio 16.7. Excluding cash, P/E is 13.4. The average growth over the past four quarters was 77%. The following chart shows the share price vs. earnings. The green line is price and the blue line is share price. 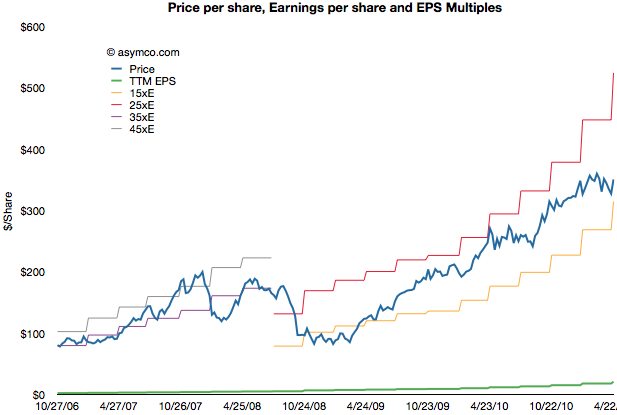 I also added multiples of the earnings to show how the stock traded in certain multiple bands. Apple’s cash for short-term and long-term marketable securities totaled $65.8 billion at the end of the March quarter. Cash increased by $6.1 billion. The increase in cash is net of approximately $900 million for prepayments and capital expenditures related to the strategic supply agreements that Apple announced last quarter. 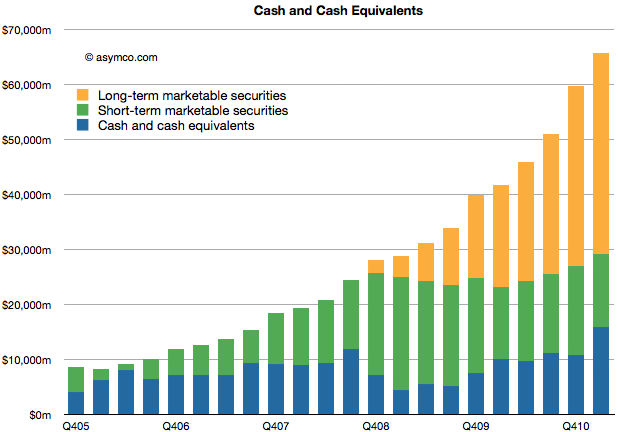 The following chart shows the historic cash, short-term and long-term liquid assets Apple holds. Is Android responsible for Apple's deep market discount? At last night’s closing price Apple was trading at a P/E of 16.3. Excluding cash that ratio was at 13. On a conservative forward basis (my estimates) the stock is priced at less than 10 times next twelve months’ earnings. These figures show a remarkable pessimism that has persisted around Apple for years. It was slightly, but not much, worse during the great recession. It persisted whether the company was growing at 30% of, as now, 95%. There are many hypotheses about why Apple’s earnings and growth are considered worthless. They come and go with the whims of the age: recession, elitist, luxury branding, health issues, macro “headwinds”, earthquakes, phantom competition. Lately it’s become fashionable to blame Android. That’s a curious thing to me, because Android has been discussed at length here and it has been shown to be, for the time being, benign. Apple has not “lost sales” to Android as it has been selling all it can produce. In some ways it’s been a boon as a co-belligerent against non-consumption. As chronicled here, this quarter I went through three sets of estimates. This is a departure from my standard practice of sticking with one forecast made three months in advance. I felt last quarter was filled with materially important developments which deserved updating. I wanted to see if the additional information helped or hindered predictability so I put my three predictions side-by-side and measured the errors. I also added the “legal leak” from April 15th (published April 19th) to see whether it was an accurate predictor. The table below shows the error rates with the lowest error highlighted. Thanks to Nilay Patel at This is My Next for posting the complaint filed on April 15th against Samsung by Apple which revealed some potentially material data about its performance in the last quarter (which won’t be public until the 20th). 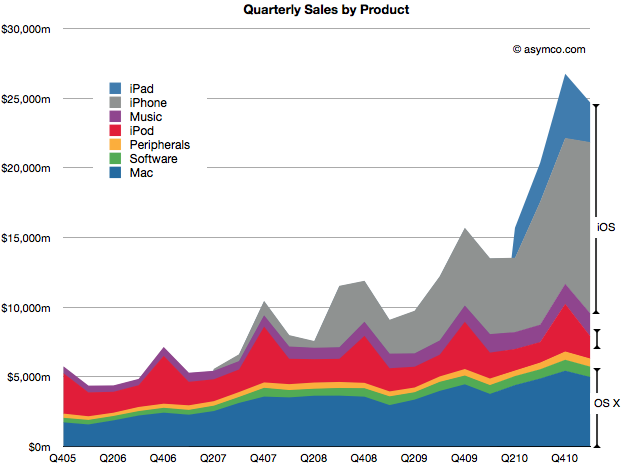 “By March 2011, Apple sold over 19 million iPads”. These numbers are material because we know units sold prior to CQ1 and can derive the minimum units sold for these three product lines during Q1.